There are a lot of choices you have to make as an adult. Some are complicated and some are important. Others involve daily inconveniences like doing dishes or deciding the right moment during a movie or game to re-up your stock of buffalo wings. Those last couple can be solved. 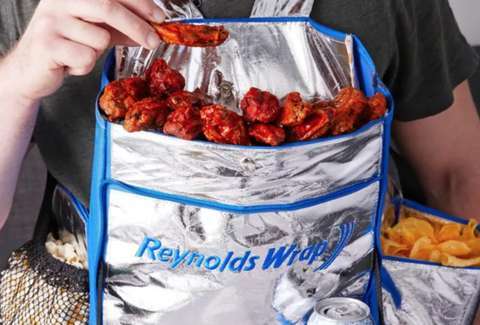 Reynolds Wrap -- yup, the aluminum foil company -- introduced a "Hunger Harness" for the Super Bowl earlier this year. It's basically a feed bag that straps to your chest. In honor of March Madness, the vest that turns you into a trough for humans is back in all of its sadly ingenious glory. What can you expect from an invention such as this? The main pocket is a thermal pouch to keep items like wings or a panini warm. Or, I guess, spaghetti? It's your body and your feed bag. Put whatever you want in the thermal pouch. It also has an "integrated food tray that turns you into a human table." There's also a thermal drink holder and a mesh pocket for salty snacks. To top it off, there's an "insulated dip holder" to alleviate your need to yell, "Who moved the onion dip, Steve?" It's on sale now for $4.99, and a representative says it's only available in "very limited quantities." 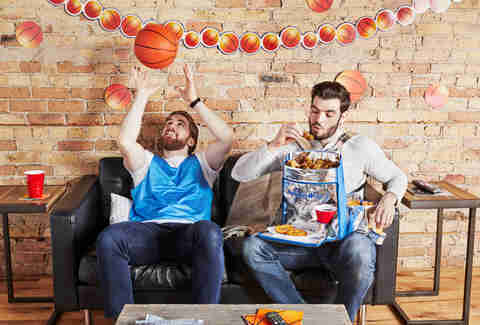 If your bracket isn't already broken, you'll never have to get off the couch again... unless you eat your way through everything you stuffed in the harness.